Looking for a weekend getaway with all of your sisters and girlfriends? Bridgeport Waterfront Resort and Stone Harbor Resort are happy to assist you. Call and make reservations for the weekend and they will have a variety of different activities for you. And leave your car in the parking lot, because there will be a free trolley to take you, your friends and your purchases all over town from 11am to 8pm on Saturday! 9am Complimentary Yoga with Val Oestreich; Family Friendly, all ages welcome! To make reservations at Bridgeport Resort call (920) 746-9919. Friday, April 26 Only: "Dead Tuesday--A Mardi Gras Murder Mystery" presented by Rogue Theater 6:30 pm, $40 per person. 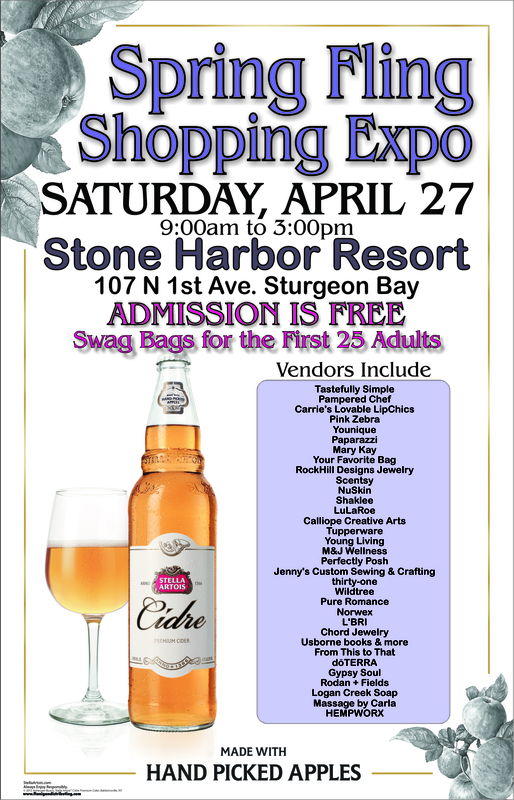 Reservations required but anyone is able to attend and need not be a guest staying at Stone Harbor. Paint & Sip $45 (includes glass of wine) *Please note that all may attend this event and need not be Stone Harbor guests. Dave Steffen Band will be performing April 26 & 27. To make reservations at Stone Harbor call (920) 746-0700. The Door County Trolley will be available running throughout Sturgeon Bay on Saturday from 11 am - 8 pm FREE of charge, compliments of Stone Harbor Resort, Bridgeport Resort, the Sturgeon Bay Visitor Center, Bay Shore Outfitters, Bliss, Crate, Kitty O'Reillys, Poh's Corner, and Union Supper Pub. Make sure to patronize these businesses and thank them for their support!